The freezing weather has led to further disruption for residents and businesses in Lancashire. West Lancashire MP Rosie Cooper has said she has received a "huge number" of calls about roads not being gritted, leaving people stuck in their homes. 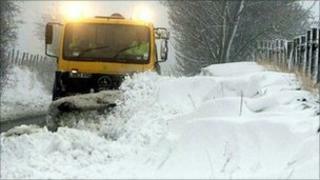 However, Lancashire County Council said snow ploughs and gritters had been out on the roads around the clock. Some community transport schemes have also been cancelled due to treacherous conditions on side roads. Ms Cooper said: "I have had a huge number of telephone calls and e-mails complaining at the abject failure to grit the roads to make them safer. "There are older people stuck in their homes, people unable to get to the shops for essentials, my staff helped to push people's cars up Burscough Street [Ormskirk] as they were skidding and sliding backwards down the hill. "There are local businesses for who this is the busiest time of the year and they cannot get their staff into work." Lancashire County Council said salt became less effective at temperatures below -5C. Temperatures have plunged as low as -15C on some nights. Dial A Ride services in Blackburn, Darwen and Rossendale Valley, which cater for the elderly and disabled, have been suspended. They intend to run a reduced service on Wednesday, a spokesman said. Similar schemes operated by Lancashire County Council and Preston Community Transport have also been affected. The cancellations mean some people have no means of getting out of the house for vital appointments. Brian Derbyshire, from Lancashire County Council, said: "We're looking out for those that have been highlighted as being the most vulnerable." Lancashire Police have also urged people to clear all snow from their vehicles before taking to the road, as it poses a risk to themselves and other drivers.